Nintendo's latest Pokémon title, Pokémon Quest, is a tapping adventure for Nintendo Switch, iOS, and Android, set in the world of Tumblecube Island. This island is a blocky, colorful place that's populated by the original 151 Pokémon first seen in Pokémon Red and Pokémon Blue. In Pokémon Quest, you'll befriend wild Pokémon and take them on Expeditions, earning ingredients to cook recipes to befriend even more Pokémon. It sounds simple enough, but there's some complexity when it comes to handling the moves your party's Pokémon will use on Expeditions. Here's everything you need to know about Pokémon combat and moves in Pokémon Quest. 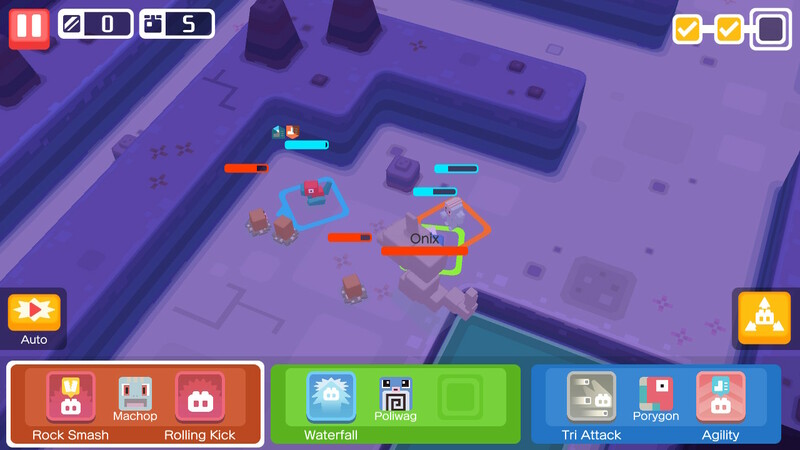 Combat in Pokémon Quest is pretty simple. You select a party of three Pokémon and send them on Expeditions, where they'll use their equipped moves to defeat wild Pokémon and eventually fight a stronger, stage boss. Your Pokémon will automatically move around the map and can't be controlled individually. There's a button on the bottom right side of the screen that allows you to order your Pokémon to scatter, which can be helpful when trying to dodge a harmful attack. Other than that, your Pokémon are on their own when it comes to determining optimal positioning. Unfortunately, their positioning isn't always the best, so keep an eye on your team even if running in Auto Mode. Yes, there's an Auto Mode, which allows your Pokémon team to automatically decide when to use their moves in battle, for a totally hands-off experience (at least during Expeditions, anyway). There are multiple ways to view the moves that are available to your Pokémon. Simply tap "Edit Team" and select one of your Pokémon, then you can choose either "Power Charm" or "Training." If you're just looking to check out what your moves do, you'll want to use the "Power Charm" menu since you can tap on a move to see it's tooltip. In the "Training" menu, on the other hand, you'll have to long press the move's icon, which is honestly just annoying. 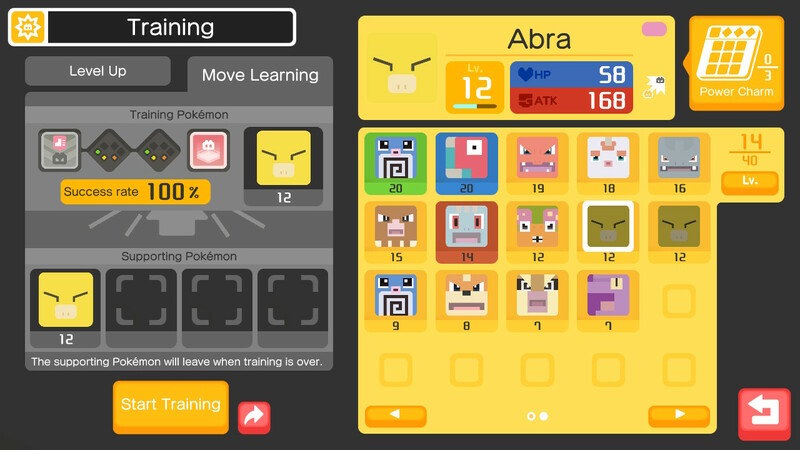 On each move's tooltip, you'll find the move's icon, the types of Move Stones that can be used to increase its potential, as well as its ATK, Wait, and a description. The tooltip shows the move's base ATK number only—it's not modified by your Power Stones. Wait is basically the move's cooldown. A Wait of five, for example, means the Pokémon can use the move again in five seconds. As with other attributes, there are Power Stones and Bingo Bonuses that can lower the Wait of certain move types. As in any Pokémon game, each move will have a corresponding type. 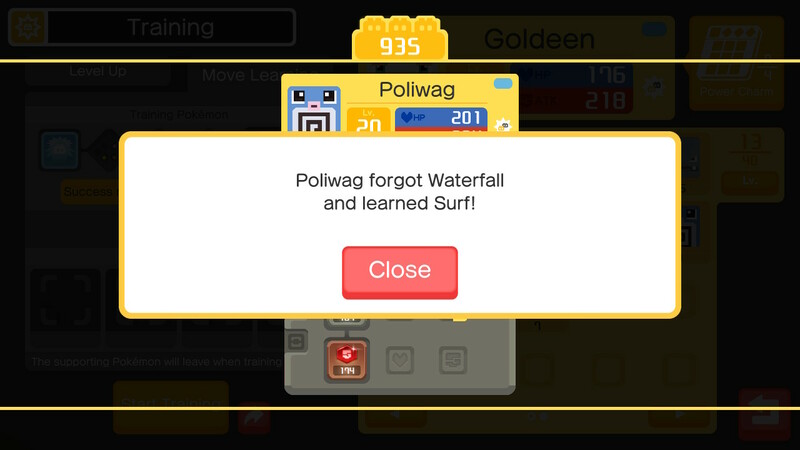 Pokémon Quest features all of the same move types as current mainline Pokémon games: Bug, Dark, Dragon, Electric, Fairy, Fighting, Fire, Flying, Ghost, Grass, Ground, Ice, Normal, Poison, Psychic, Rock, Steel, and Water. When wild Pokémon join your camp, they'll have either one or two random moves of the appropriate type (or generally native to that Pokémon species). If a Pokémon has only one move, it'll feature three Move Stone slots, and if the Pokémon knows two moves, only two Move Stone slots are available. In some cases, depending on the Pokémon and that primary move, it may be more desirable to have a Pokémon with only one move to ensure they're always using their best attack, while also increasing the amount of supplemental Move Stones that can be equipped, ultimately improving the move's effectiveness or power. Your Pokémon can learn new moves by using Move Learning, which is accessed by tapping "Edit Team" then the "Training" button on the right. Once you're in the Training menu, simply tap "Move Learning" to open its menu. The Move Learning menu is identical to the default Training menu, which just awards experience. The Move Learning process is relatively simple: Drag the Pokémon you wish to change over to the open slot, then choose Supporting Pokémon from your other available Pokémon to help increase the success chance of learning a new move. Using higher-leveled Pokémon will increase the chances of learning a new move, especially if the Supporting Pokémon is in its second or third evolution. Try to focus on using Pokémon of the same type as the Pokémon you're trying to train, as they'll add the highest percentages to your success rate. You'll have to select which existing move you wish to replace before training, so if your Pokémon knows two moves you do have that choice. Remember that using a Pokémon as a Supporting Pokémon for any kind of training will result in losing that Pokémon. Always make sure you're sacrifi—err, training with the right Pokémon. If your training is successful, the existing move you have selected will be replaced with another valid option from that Pokémon's move set. The chance of successfully learning a move will decrease gradually the more Move Learning a single Pokémon goes through. Through Move Learning, your Water-type Pokémon that knows Bubble may see it replaced with a higher-powered Water move, such as Hydro Pump. It's worth noting that this may not always be the case, and you may find that you've lost a preferred move for a weaker or less relevant move that doesn't quite meet your expectations. Additionally, you may keep learning the same moves over and over—Move Training is definitely not for the faint of heart. The more Move Training you attempt, the harder it'll get. You're essentially gambling with your Pokémon's future. Good luck. Move Stones are absolutely essential items that can increase the power and ability of your Pokémon's moves. Move Stones are randomly awarded upon successful completion of an Expedition and can also be purchased in the Poké Mart for $2.99 each. It's worth noting that you can buy only one of each stone using real money, so you'll still obtain the vast majority of your stones by actually playing the game. You can freely equip and unequip Move Stones just as you do Power Stones. Broadburst Stone (Purple): Increases the width of spread moves by one. This stone is very helpful for ranged-based Pokémon, since it increases the overall width of the equipped move, which can help them hit more wild Pokémon targets. Scattershot Stone (Pink): Increases the amount of hits from a move, but decreases its damage. This stone affects projectile-based moves such as Rock Throw, adding one additional hit (or in this case, rock) per stone equipped. Sharing Stone (Blue): Increases the effect chance for buddy Pokémon. 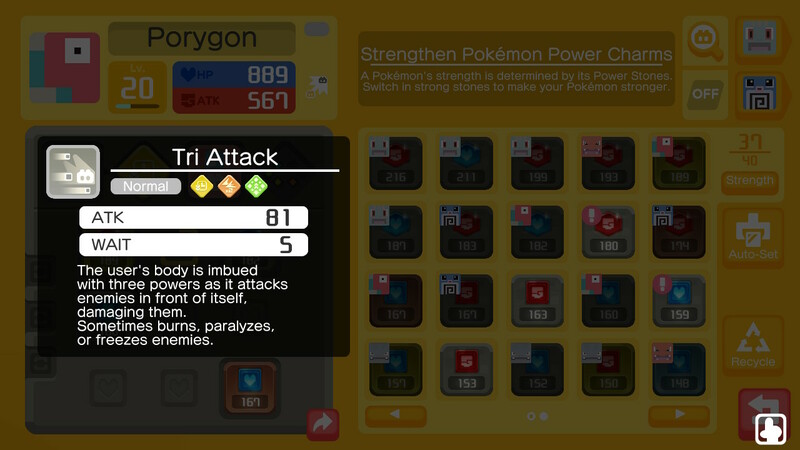 This stone causes any beneficial moves used by a Pokémon (such as Bulk Up and Harden) to also share some effect with additional Pokémon on your team. Each stone will cause 25 percent of the move's effect to be shared with the other party Pokémon. Stay Strong Stone (Green): Increases the duration of move effects. This means that the effect of your Pokémon's status increasing (buff) moves will last 25 percent longer, and the effect of moves that inflict negative status effects (debuff) on enemy Pokémon will also last 25 percent longer. Wait Less Stone (Yellow): Decreases the time required for a move to recharge. This stone reduces the cooldown timer of the equipped move by 5 percent. Whack-Whack Stone (Orange): Adds an extra attack to the Pokémon, but increases the wait time by 50 percent. This stone allows your Pokémon to repeat a single move (each stone adds one repetition) at the cost of increasing the move's cooldown.